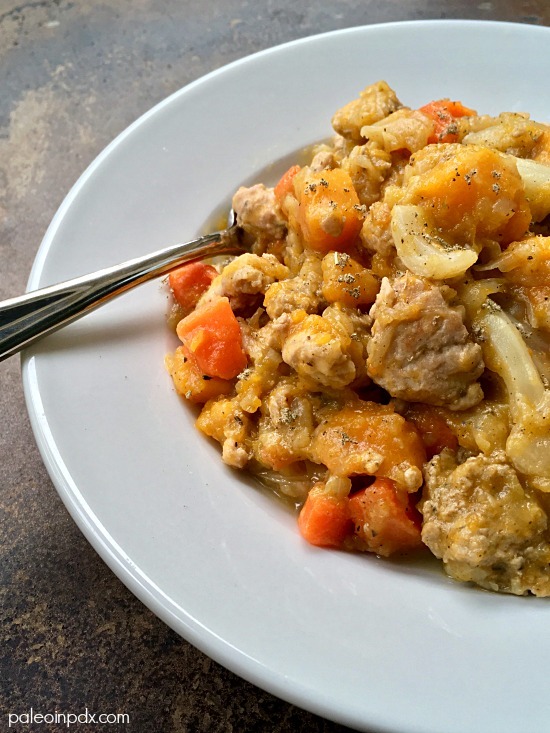 This turkey butternut squash stew is the epitome of healthy comfort food. It’s the perfect antidote for a chilly day and loaded with nutritious ingredients. I’ve made it a couple times already and already know it’s going to be on repeat this winter. On another note, we got our tree over the weekend — on a very rainy, wet day (we ate this stew for dinner that night). We went to a tree farm on Sauvie Island and picked out a little Douglas Fir. When I spotted the tree, I swear it had a beam of light shining down on it. It was so radiant and emitted such a glow. We instantly agreed on it too, even though we had intentions of getting a Grand Fir when we got to the tree farm. Anyway, the tree is perfect and the house smells lovely with its aroma. Lights are on, but we’re waiting to adorn it with ornaments until next week since we’ll be out of town. Our kitties might be too tempted by the shiny bulbs while we’re away! Anyway, if you want to get a glimpse of our little tree thus far and see me hauling it in the wagon, visit my Instagram page HERE. Melt butter or ghee in a large pot over medium heat. Add the onion and garlic, and sauté a couple minutes, until onion is translucent. Next, add the ground turkey breast and ground turkey sausage. Season to taste with a little sea salt and black pepper. Continue to cook meat for several minutes, until browned, breaking up the pieces with a spatula as needed. Next, add the cabbage, 1/4 cup of broth, and a bit more sea salt and black pepper. Stir, reduce heat to medium-low, and cover with a lid. Let simmer for 10 minutes. Add the butternut squash, carrots, poultry seasoning, dried sage, and bay leaf. Stir well. If need be or desired, add up to 1/4 cup more broth. Cover with lid and let cook for another 10 minutes or until squash and carrots are tender. Taste and adjust seasoning, as desired. Remove bay leaf before serving.